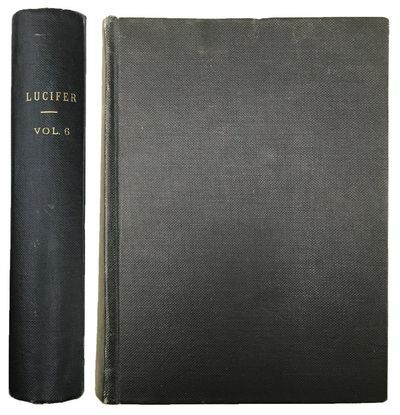 Lucifer; a Theosophical Magazine, designed to "bring to light the hidden things of darkness". Volume VI March-August 1890.
by [LUCIFER] Helena Petrovna BLAVATSKY (1831-1891), & Annie BESANT (1847-1933). London:: Theosophical Publishing Society, 1890., 1890. Small 4to. [iv], 528 pp. A few text figures, double-page plate (between pp. 238-9); outer margin pp. 11-12 + 221-222 trimmed, pp. 351-2 margin torn with piece missing, staining to pp. 348-9, occasional pencil marginalia (such as pp. 42, 135, 178-9, 181, 187, 525. Original black buckram, gilt spine title. Pencil mark on rear pastedown, "Ancestry Vol. II[?]" - also the person who contributed the marginalia. Very good. Rare. The chief magazine of the Theosophy Society which was established in 1875 by Helena Petrovna Blavatsky, Colonel Henry Steel Olcott, William Quan Judge, and others. They purport to be "seekers of the Truth." They were initially interested in the occult, Cabala, etc. They were also fully invested in the study of Eastern religions and ideology. With the passing of Blavatsky in the following year there was a schism that served to divide the group. Helena Petrovna Blavatsky (1831–1891) was a highly controversial Russian occultist, spirit medium, and author who co-founded the Theosophical Society in 1875. She gained an international following as the leading theoretician of Theosophy, the esoteric religion that the society promoted. She founded this magazine, Lucifer, trying to debunk paranormal phenomena and raising philosophical discussions. She also founded the Theosophical Publishing Company when other publishers would not publish her work (much as did the Richard Burton Society for the Arabian Nights at the same time). She dies after succumbing to the prevailing influenza epidemic during the winter of 1890-1. Annie Besant (1847-1933) was also very controversial, further involved in women's rights, and supported both Irish and Indian self-rule. She met Blavatsky in 1890 and soon partnered with her for this publication. She became President of the Theosophical Society in 1907. She was a prolific writer and very influential in her circle.